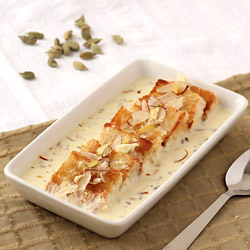 Kalakand, a delicious milk based sweet with hints of cardamon, is yet another way of enjoying the goodness of milk. 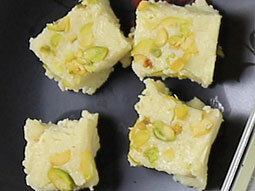 It is similar to Barfi and usually prepared on festivals like Diwali, Navaratri and Holi. Kalakand can be prepared at home in two different ways; 1) in traditional way by simmering the milk on low heat until reduced to semi solids, and 2) in instant way by using Paneer and sweetened condensed milk. The tradition cooking approach requires longer cooking time compared with instant method. 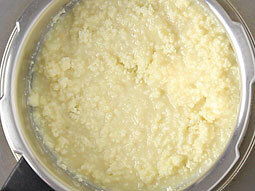 However, whether its cooked in a traditional way or in instant way, its final taste and texture is similar. 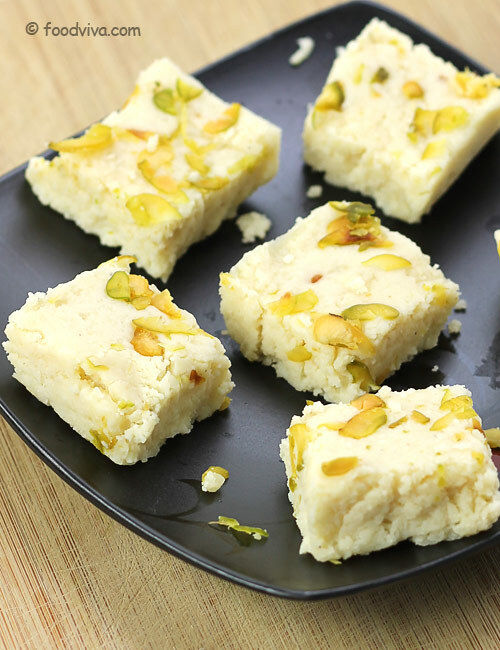 This Kalakand Recipe follows instant approach, requires only three ingredients, sweetened condensed milk, paneer and cardamom, and explains entire process with step by step photos. You can either use the ready made paneer or fresh homemade paneer or chenna for this recipe. 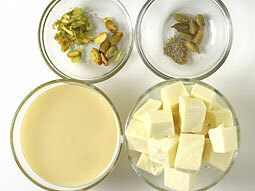 Follow this recipe (step-1 to step-5) to make fresh homemade paneer/chenna. Pour 2-3 glasses of water over prepared chenna/paneer to remove any sourness of lemon juice. Keep it aside until required. 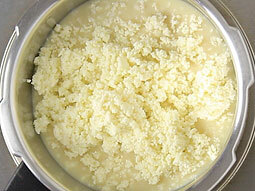 If your want to use readymade paneer and if it is frozen/refrigerated, thaw it at room temperature. Either grate it using a grater. 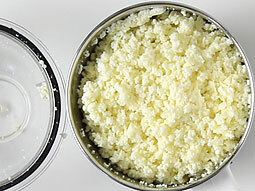 Or alternatively, you can crumble it using a mixer grinder; add the paneer cubes in the small jar of mixer grinder and pulse it few times to crumble it. Grease inside surface of small deep plate with ghee. Heat the mixture over low flame. Stir continuously and cook until it turns thicker. 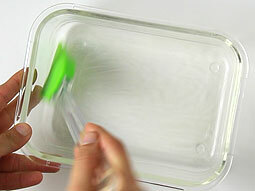 As you stir and cook, mixture will start to stick on the sides of the pan as seen in the photo. 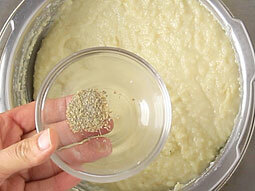 It will take around 4-7 minutes to cook the mixture. Transfer mixture to greased plate. Shake it gently to evenly spread the mixture. Level the mixture with a spatula. Sprinkle dry fruits over it and gently press them with a spatula. Let it cool down to room temperature. Cover and place it in the refrigerator for 2 hours to set. 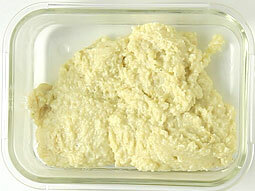 Remove it from the refrigerator and cut into small pieces. Gently remove the pieces and transfer them to a serving plate. Serve and enjoy. 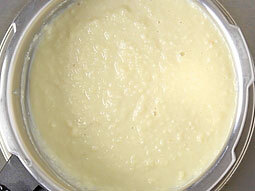 First mix the condensed milk and paneer very well before turning on the heat/flame. This will prevent sticking while cooking. Use freshly made paneer instead of refrigerated store bought paneer. Freshly made panner help make kalakand softer. Refrigerating kalakand will make it harder. 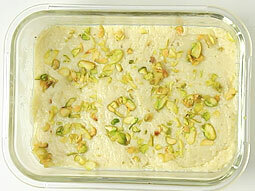 If you like softer kalakand that you can eat with spoon, do not put it in refrigerator to cool down. 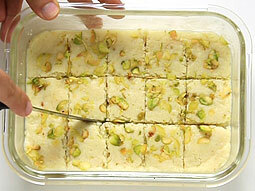 Serving Ideas: Serve kalakand on its own or with other namkeen or salty snacks like chakli, farsi puri, sev, mathri etc. Why does my kalakand take 30 min to thicken vs the 4-7 min suggested. Sometimes I use homemade or bought paneer and sometimes ricotta. Same results. It takes a long time. Using electric stove. Maybe too much heat? Response: Hello Stella, I am not sure why it takes too much time to cook as I have made this so many times but never takes 30 min. It might happen if you increase the quantity or double the recipe. U r amazing apki vajah se maine bahot khana banaya muje kuch nahi ata tha sans chilati thi magar apke sabhi recepie se maibe bahot kuch sikha plz aap muje nonveg aur seafood ki website boliye. Response: Thanks you Shrutika for trying our recipes and we are glad that it helped you learn how to cook. We are vegetarians and do not cook non-veg at home and hence we do not write nonveg recipes. Mein aapke site k wajha se bahut kuch sikhi Hu thank you so much par plssss baki sab recipe bhi hindi mein bataiye. It's a request please. Response: Hello Neha, we will definitely convert all the recipes in hindi soon. 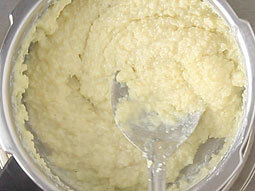 Thanks for nice recipe.. please share "Thabdi Penda" recipe. Response: Hello Ruchita, we will definitely try to upload the "Thabdi Penda" recipe. Your all recipes are awesome.i follow these throughly.my question is that in kalakand recipe can i use kashew nut or raisin instead of pistachios?and you did'n use sugar.so how can it be sweet? Response: Yes you can use Cashew Nut or Raisin as a garnish. 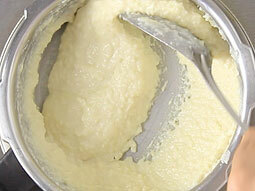 This recipe uses Sweetened Condensed Milk. Kalakand gets its sweetness from it.